Beautiful Bangkok ... Bangkok offers so many differnt options for everything from fun to food to history and sight seeing, it's undoubtedly one of my all-time favorite cities. Lub d is a top quality hostel located on Decho Road, in the heart of Bangkok just off Silom road. The hostel is within a short walking distance from the BTS skytrain Chong Nonsee station (8-10 min walk), Patpong area, and the commercial center where you can find shops, restaurants, bars and nightclubs from early morning until late night. Travelers are connected, via the BTS skytrain to many of Bangkok's major districts, including the pier for boat rides to the Royal Palace and Bangkok's historical area. The newly opened hostel is designed by one of the most regarded hotel designers in Thailand. It offers eight-bed dormitories, ladies-only dormitories, and private dormitories for 1-2 people, as well as normal double bed hotel rooms with a private bathroom (on 4th floor - NO ELEVATOR). 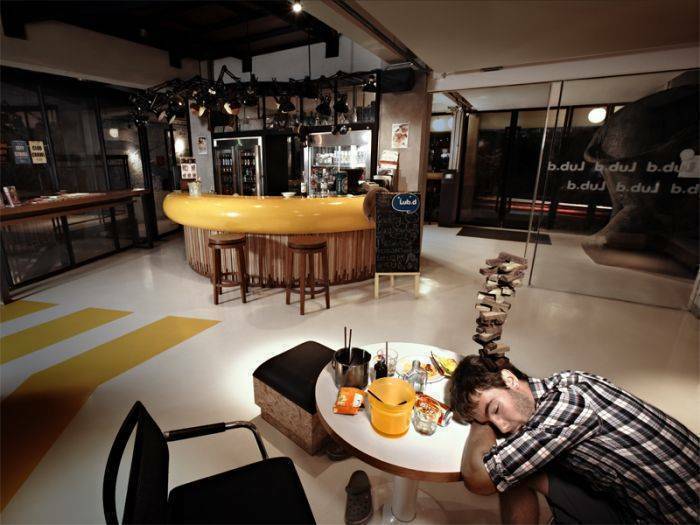 Facilities in the hostel are clean, the rooms are comfortable, and the atmosphere is friendly and fun. The safety features of the hostel is also among the best in the business, with keycard access to each room and the residential area; every floor is equipped with smoke detectors, fire alarms, fire extinguisher, and close circuit TVs. This is the perfect place for travelers who are looking for a high quality budget accommodation with a friendly & relax atmosphere. The hostel offers its guests with all the basic needs of today's travelers. There are free internet facilities , laundry room , and luggage storage available; and modern bathroom, hot shower, bathroom amenities on every floor; as well as free WIFI access, air conditioning, and clean bed linens in every room. Breakfast, snacks and beverages are also available at the bar in a large and colorful common area that services from early morning until midnight. To top it up, there is also a mini theatre for those who just want to lay-down and relax. Lub d Dormitory (2nd Floor): The 'super clean' 8 beds dormitory that has more good things than what you're looking for. Lub d Ladies' Dormitory (4th Floor, NO ELEVATOR): The luxury 6 to 10 beds dormitory in a 'ladies-only' section that offers more space and a large shared bathroom with hair iron, makeup mirror, person scale, body mist etc. designed for women. Lub d double room: A queen-size bedroom with bathroom en-suite. 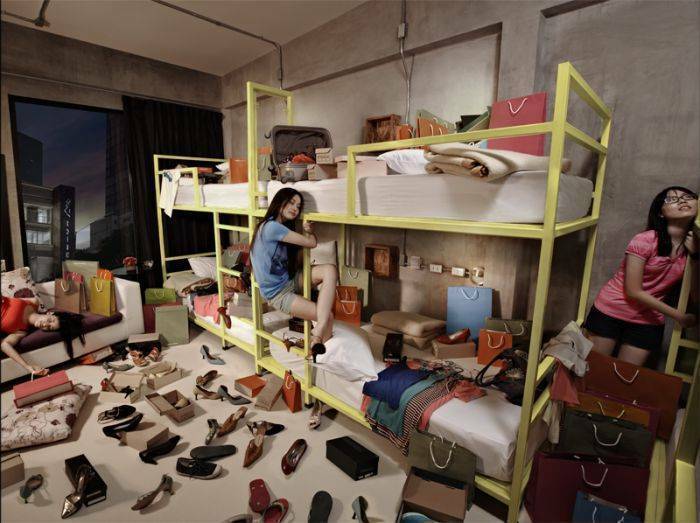 This is a well-designed room, a real break for those who seek something more than a regular room in a box. Railway twin room: A comfortable 2 beds room with shared bathroom that offers privacy together with Lub d's lifestyle. Perfect choice for single traveler or travelers who come with their favorite "buddy"
Lub d Ladies' dormitory: The luxury 6 to 10 beds dormitory in a "ladies-only" section that offers more space and a large shared bathroom with hair iron, makeup mirror, person scale, body mist etc. designed for women. To top it up, we provide our lady requests with thai spa amenities. Lub d dormitory: The "super clean" 8 beds dormitory room that has more good things than what you're looking for. • Reservations must be amended or canceled 48 hours prior to check in date to avoid a cancellation charge of the first night room rate and must be notified via e-mail. • Lud d will keep confirmed bed/room up to 1800 hrs. on the arrival day or otherwise informed in advanced for late check in. • Lub d reserves the right to charge at one night at confirmed rate for any No Show guest. • Full pre-payment is required 14 days prior to the arrival or otherwise agreed upon by Lub d.
• Payment slip is required to fax to Lub d immediately at Fax No : +66 2 634 7510. Several shopping centers are around; MBK Center, Siam Square, Siam Paragon, Central World and so on. After arriving, follow the signs to metered taxis at level 1 near gates 4 and 7. If you are approached by anyone offering to be a taxi service, we suggest you decline and continue to the metered taxi area. There you will find an attendant who will tell your taxi driver where to take you. The trip from the airport costs approximately THB 400-500 depending on traffic. Remember there is a THB 50 surcharge for travel from the airport and to have cash ready if your driver is planning to use the tollway. The total time is about 45 minutes if the traffic is not so bad. During rush hours, it takes more than an hour. Follow the signs to the Airport Rail Link and buy a ticket on the city line to PhayaThai Station (terminal station). At this station you can transfer to the BTS Skytrain, where you need to purchase the appropriate fare to bring you to the Chong Nonsi Station. Don't forget to change trains at the Siam Station and board the train going toward Talat Phlu. When you reach Chong Nonsi, follow the signs to exit 3. Go down the steps going away from the station and walk until you reach Silom Road. Turn left at the Silom - Naradhiwas intersection and walk until you reach the next traffic light at Decho Road. Turn right down Decho and you will find us on the left hand side with yellow chairs in front of the building. The total travel time is about an hour and the total cost about THB 76. After arriving at Donmueng Airport, proceed to the public taxi line. If you're approached by anyone offering taxi service, refuse and instead follow the signs to the public taxi where you can take a metered taxi to the hostel. Travel to our Silom hostel costs approximately 250 - 350 baht depending on traffic. Remember there is 50 THB surcharge and to have cash ready if your driver uses the tollway. Total travel time is about an hour if there is little traffic, but may take much longer during rush hour. After arriving at Donmueng Airport, take airport bus A1 or A2 to Mo Chit BTS station. Buses run 1-2 times per hour between 9. 00 and 24. 00 with flat fare of 30 Baht. You should allow about 60 minutes to arrive Mo Chit BTS depending on traffic. When you arrive at Mo Chit BTS station, get enough change to travel to the Chong Nonsi BTS Station on the Silom line (Note: You need to change train lines at the Siam station). The total trip from Mo Chit to Chong Nonsi by skytrain costs 42 THB. When you reach Chong Nonsi, follow the signs to exit 3. Go down the steps going away from the station and walk until you reach Silom Road. Turn left at the Silom-Naradhiwas intersection and walk until you reach the next traffic light at Decho Road. Turn right down Decho and you will find us on the left hand side with yellow chairs in front of the building. The total travel time is about 1. 5-2 hours.